In a stunning display of determined riding, Eureka’s warrior princess, Jude Jonasson lead from gun to flag to take this year’s “Charlie”, one of the clubs most coveted trophies. On a windy day, and over a challenging parcour, the longest club race of the year is a real test of endurance. To win this race takes a special kind of rider – on this day, Jude proved to be made of the right stuff. Proceedings got under way with the shove off in the shade of the big tree at Learmonth. John Faulkner and Jude leading the way with a handy 27 minute advantage. They rode as a pair for the first lap, but it became apparent that they were in fact an odd couple and Faulks was struggling with the gruelling tempo being set by Jude…and a rear tyre that wouldn’t stay inflated. Now at this point what do you do? There is still over 50 kilometres to go, you’re suddenly by yourself, but you’re feeling good. Sometimes you just have to roll the dice. Whether Jude made a deliberate decision or not, we’ll probably never know, but our heroine (of this story) kicked it up a gear, put her nose into the wind and nailed her colours to the mast. Jude completed the second lap before Scratch had completed the first. That gave her about a 10 kilometre advantage which fuelled the enthusiasm, and set her course in stone. Chasing the warrior princess some 12.5 minutes back was the trio of Danny “Fidel” Whelan, Terry Collie and James Gretton. Fidel is struggling to overcome injury and would normally ride further back; today he added a little fuel to the Gretton/Collie fire. Until recently Terry would have been chasing James, however James is being “rewarded” for his improving form by being moved back towards the faster bunches. 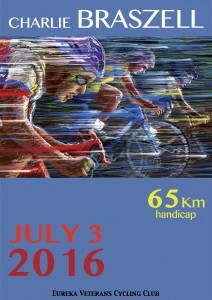 This reminds us of a quote from dual Tour de France winner Greg LeMond, ‘It never gets easier, you just go faster’. While the trio rode well early, they proved to be a brittle bunch. Fidel rode away from Terry and James as they tackled the hill in Hendersons Road. Fidel striking out on some Thommy Voeckler style TV escapade. The remaining duo riding out all but the last lap as a training ride. The 8 minute bunch of Michael “Doc” Veal (late addition after missing the start), but fortuitously being”up the road”), Bob “Muncher” Morley and new riders Mark O’Callaghan and James Knipe, had a handy advantage over the back of the race but were going to have to work hard to catch the front. Captain Muncher assumed a tutorial role with some quick lessons in race craft to the two new lads, track turns, rolling turns, etc., they proved smart guys and picked it up very quickly. For the chase to be successful, discipline was essential and who better than the sado-masochistic Muncher to whip a bit of discipline into the bunch. James was very strong and was on the front over the hill each time. Mark had the training wheels on around the corners and struggled a little on Hendersons hill but soldiered on. The Doc was surprised by a 4WD in the chicane and thought an off and a losing a bit of bark was better than getting run over. James and Mark wanted to go back and scrape him off the road, but Madam-Lash Morley was more mercenary and called them on. They caught Terry, James and the disorderly Fidel in the avenue. Today the chopping block was the powerful duo of Grant “Smokey” Dawson and Rob “Big Mig” Phillips. Essentially on a suicide mission they were successful in staying clear of Scratch but burnt their matches catching the Morley bunch. Normally the addition of these two war horses to a bunch would have ensured victory, however they ultimately paid the price of their chase. Smokey blew up and Rob was bobbing his head. James and Bob hammered into the avenue and found themselves alone as Rob also blew up. Rob and Grant only know one way, full gas until you blow! Into the last lap this left Jude out front with a massive lead, Bob and James teaming to hold down second and third, Mark destroying himself to hold fourth and the black storm that is scratch looming on the horizon for fifth and fastest. Scratch weren’t on the mettle today. On paper Phil Cartledge, Damien Kierl, Rob Ellis and Dean Wells appeared a formidable force especially on a challenging course over the extended distance. Phil was dominant and drove them hard as always. Damien just didn’t feel it today and didn’t finish with the rest, bowing out mid race. Dean was perhaps just off his best today after spending some time under swaying palm trees on a tropical island paradise, he literally “froze” in the cool conditions and dropped away with 5 kilometres remaining. Rob Ellis rode well and kept tapping away in the big gear all race, he was there chasing strong at the end. However it was Sir Farqhuar Cartledge that opened a gap through the chicane them held a small margin over Rob as they stormed into Hendersons Rd the last time. The gap opened as he belted up the hill to take fifth and fastest. Special thanks to the Braszell family for sponsoring the race in honour of one of the true legends in Ballarat’s steep cycling history – Charlie Braszell. Standing L-R: Bob Morley, Phil Cartledge, James Knipe. Seated: Jude Jonasson and Geoff Braszell. * Neil Braszell unfortunately could not attend because he was on holiday in sunny Queensland. Large numbers turned out for Round 2 of the W.A.R.S. 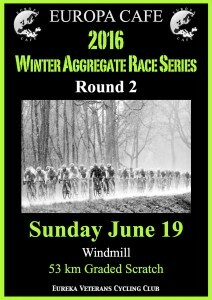 a mix of new and returning riders joined the “regulars” to provide an exciting day of racing. No wind and a strong even field suggested that the racing today was likely to be tight and tactical. That is exactly how it turned out to be – with hard attacking inevitably responded to with honest chasing and solid counter attacking. Two new riders fronted up for their first foray into EVCC Sunday morning shenanigans. Rob Ellis sported an impressively manicured set of legs that looked like they had been turning more than the odd pedal in recent months. Normally a well-oiled set of guns such as these would have been the show’s attention grabber…but unfortunately for Rob, today also saw the arrival of a genuine Ballarat cycling legend. It was always going to be interesting to see how thing would play out on the day – rarely has there been a race at EVCC with more years of combined experience than this one, so impulsive stupidity was unlikely to be on the menu. A late sprint was not going to be in the interest of Lindsay “Skun Rabbit” Burgoyne and a range of other tough, but hardly explosive peddlers. With Matt “Riff Raff” Bowman, Phil “Farquhar” Cartledge, Dean “Pepe” Griffin and the Tony “Italian Stallion” Mirabella all in attendance, the field only really lacked Brendan “Sheems” Schiemer and the Dean “Phantom” Wells to be a club championship proxy. The first lap was a pretty uneventful affair, but the bunch worked turns for the most part. Griffin and Keirl made sure that anyone who thought they would just coast along at the back “getting the mail” also played their part. That type of behaviour was not really going to be on today! This had the combined effect of keeping the pace quite high for a scratch race as the field came through for the first lap. The second lap was the signal for things to get interesting. The climb up past the quarry was hit at a steady pace and the turn into Coghills Creek Road saw the first real dig with a somewhat predictable Cartledge having a crack. Immediately the attack was met with a bunch that had its stuff together. Phil’s catch immediately brought a series of counter attacks and chases – everyone knew exactly what the score was at this point – one more big attack may have broken the elastic for a couple but the pace slowed as the bunch turned in Donovan’s Road. The easing saw Ellis and Burgoyne, alternate steady turns at the front, perhaps showing a little lack of experience. In this company you are only on the front if you are doing something and the only thing that punting along at 37 kph is doing is wasting valuable energy. Into the last lap and the enigma that is Matt Bowman was on full display. With an aesthetic when under pressure that looks identical to a bow legged squirrel trying to make piggy with a beach ball, it is never easy to really tell how he is going. He certainly looked like he was about to blow a ring gasket up the quarry hill where he seemed to be struggling to hold the wheels on the steepest section. This assessment proved to be incorrect when he promptly attacked on the turn into Cogills Creek Rd. Griffin seemed to be working on the principle that he would chase anything down in the last lap and put in a big effort to bridge across with the field in single file. Mirabella attacked as would be expected at the junction and the next 5 kms saw Mirabella attacking, Burgoyne following and Griffin forever closing – with Bowman having a crack whenever he had recovered a bit. At this point it was clear that now no one was going to get away alone and that everyone was too attentive to let any of the stronger riders form a combination. Tactics came to the fore and a a very settled ascent up the Donovan’s Road climb ensued. Griffin knew that the attack needed to come from Bowman, Mirabella or Cartledge, so he slowed the pace behind Ellis and Burgoyne to force the others to the front. This was partly successful as it got the Mirabella and Keirl to move up, but Bowman and Cartledge stayed resolutely at the rear until of course Bowman went. Cartledge responded straight away and Griffin left the prime spot on Keirl’s wheel to try and latch on to what may have been the winning move. Cartledge looked like he was going to make it across to Bowman…and Griffin seemed to have Cartledge pretty well covered, but Bowman has a knack of holding a pace that is hard to make the final couple of meters up on and today was no exception. Cartledge faltering just as Griffin was thinking he was going to get a quick recovery in. This all corresponded to Keirl and Mirabella going and the group was strung out with 300 meters still to go. Unfortunately for Bowman, it never really looked like he was going to hold off Keirl, but he managed to hold off everyone else. Keirl first, Bowman second and some skinny old bald bloke who looks like he could do with a pie (Burgoyne) sneaking home for third. Great, clean and classy racing all round. Seven riders fronted the starter and all looked capable of victory. With the winner of the round 1 W.A.R.S. absent – Pete Livi – it was a wide open affair. The talented Michael Veal was astride his resplendent retro Mercx…down levers and all. His race didn’t go to plan but he was certainly handy during a post race medical incident when A Grade rider Matt Bowman burst some stitches in the change rooms after the race. Andrew Rushton was on loan from A Grade and was sure to add some fire. Grant Dawson hadn’t been seen for a while but we all know how strong he is, even if he is always found wanting in the tactical stakes. New rider James Knipe, and a second club race for Mark O’Callaghan, both making interesting variables. Adding the lively Ricky Calvert and the old warhorse Bob Morley made sure the anything could happen on this day. The first lap, was the typical sight of Grant “Smokey” Dawson riding off the front and Michael Veal mathematically working out the exact distance he should be left out there. This was all too much for Andrew “A Grade” Rushton, and he spun back up to Dawson on numerous occasions. The pace was high and riders had to watch for gaps as it would be all over. On the second lap, the pace over quarry hill was lifted by Calvert and Dawson and the retro Mercx with postilion was off the back. In fact the pairing turned around went back to see how that race finished. With more of Dawson off the front and constantly being covered by Rushton or Calvert, the pace lifted again on the same hill on the bell lap. Knipe and O’Callaghan went off the back, and worked hard but never got back on. Up over the hill on Donavan’s road, the pace lifted and Andrew Rushton got on the front and led the crew to the finish line. Approaching the finish line, it was Rushton on the front with Calvert stuck to his wheel. Third wheel was the cagey Morley and Dawson sat fourth in line. Morley attacked first, striking out to the right pulling a gap over the two in front. Dawson, after riding off the front for most of the race passed perpetual the bridesmaid – Morley – on the outside to take a well-earned victory. Calvert rode well to hold onto third place. Seven riders fronted up to the line in calm, fine conditions for Round 2 of the Europa Cafe W.A.R.S. The two C Grade “visitors”, Danny Whelan and Ken Heres ensured that the pace would be brisk right from the start. The bunch worked well, with all swapping turns smoothly until the turn onto Donovans Road. The small ‘hump’ in the road and the rise into the S bends saw the bunch split, with Steve Linanne reflecting that this felt ‘much harder’ than his first race two weeks ago. The front markers pushed to the top of the rise, and then eased up to allow the bunch to reform. The bunch stayed together for the rest of the race, with only a couple of minor visits by various members to ‘Outthebackistan’ over some of the rises. The bunch reforming quickly each time. Danny Whelan did a heroic job with his painful hip, taking the brunt of the wind on Donovan’s Road each lap. In the last lap, Mandy made a futile attempt to ride away just before the top of the last rise, but she was quickly reeled in. Apparently, the answer is in the affirmative, as he popped over the line in third place, behind James and Roger. Europa Café which is located right in the centre of Ballarat at 411 Sturt Street, sponsor our Winter Aggregate Race Series. is open every day from 7:00am for breakfast and lunch. Round 1 of the W.A.R.S. and it was a no holds barred, knock ‘em over, drag ‘em out affair. Two new riders were not given any quarter…and willing racing was the order of the day around a familiar, yet different course. The Mt Misery course is a different beast in reverse, requiring a review of race tactics. A good field of 18 racers in three grades tested their mettle. Special thanks to out generous sponsor of the series, Kathryn and Jason Haire at Europa Café. The winners of each race receiving a $30 voucher to enjoy in the café and the winner of the overall series will receive honour, glory and a $100 voucher. Thanks also to the Phantom for the contribution to the A Grade report. 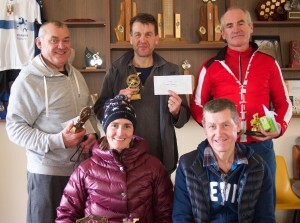 There is a buzz around the club at the moment – partly due to new riders and their successes – and partly due to an ever increasing number of competitive A Grade riders and their changeroom trash talk. A new race circuit requires a whole new range of tactics. 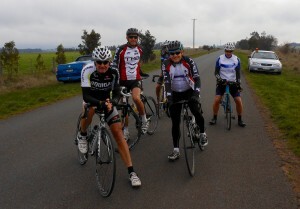 The Ballarat based riders train around the circuit in the clockwise direction – so did they have an advantage? Matt Ayres was completely lost on the new circuit and would require tips from the others throughout the race so that he knew what to expect…would he even be a factor at the finish? From the start the A Grade bunch was haphazard at best, however Phil Cartledge ignited the pace over the Weatherboard crest and raced down the hill towards the right hander with gay abandon. Through the turn he quickly opened a 100 metre gap, such was his speed. The bunch sat up to allow a gap, then Dean Griffin organised the bunch into rolling turns. After a few kilometres they reeled Phil back in – the bunch noting how well he was riding even with the perennial bug he seems to be lumbered with. Along Ercildoune Road a few riders attempted some quick darts off the front, none attracting anyone interested in pressing the matter and they were all easily covered by Griffin and Peter Canny. Andrew Rushton went off the front for a short while, but he too was soon brought back into the fold. Dean Wells took over the pace making as they entered the narrow section of road – he had the field weaving all over the tarmac in an effort to discourage attacks – however Phil came through before the turn onto Black Bottom Road and stretched the bunch out as he swept through the corner. The move caught Wells out and he was happy to receive a tow back to the bunch from Matt Ayres. The bunch regrouped only for Rushton to again roll off the front and open a small gap. Tony Mirabella sensed an opportunity and crossed to Andrew. The pair were able to eke out a margin of around 100 metres, but under the road captaincy of Griffin, the bunch rolled turns and kept the duo within stones throw. Rushton’s efforts off the front were more to gauge his own fitness level than try a long range assault, he eventually eased off and left Tony to his own devices. The bunch managed the gap behind Tony as the race turned eastward and climbed to the high point of the course along Waubra-Ercildoune Road. Rushton’s fitness finally gave out and he eased off the back. After cresting the peak the bunch worked quickly together and caught Tony – a high pace ensued as they raced towards Addington. Riders scrambled for position as they closed in on the sharp right turn, Phil again winning out and he opened a gap as he powered out of the turn. Matt responded and quickly closed the gap. Canny then assumed the pace making up Edmonston Road, with the two Deans sitting outside him to block the narrow path and stop any sneaky attacks. Nearing the top of the final climb Wells made an attack that was negated by Phil. Griffin dragged the rest of the bunch across and again it was gruppo compacto. Canny took over the pace making again as they charged down towards the final turn and started to close in on the B Grade race. Phil kamakazied through to get the lead before the left turn – he ended up overshooting the tarmac and found himself in the gravel, but kept upright and was soon back in the mix. Matt asked where the finish line was as the the bunch regrouped not far behind B Grade. This could pose a big problem…would both bunches be sprinting at the same time? ‘This isn’t a fast enough lead out for you boys to sprint’ Wells quipped to Phil before taking off in pursuit of B Grade. The boys quickly fell in behind and they roared down the gully, passing B Grade at the bottom. It was full speed ahead as they cleared the rise – until Wells’ run ended over 700 metres from the finish line. Canny found himself on the wrong wheel and started looking for options, Griffin was already jockeying for a new position and Phil was trying to work out where everyone was. Tony out wide at the back started to wind up for a long range sprint, but had to check as the Tail Car squeezed past on the outside. Time seemed to slow as the bunch spread across the road – but really it was just the speed dropping even further as everyone tried to keep their powder dry. Tony again found his gear and went from nearly 400 metres out – was it too far? A short moment of hesitation by the others allowed a small gap to open and it looked like Tony might yet win the day. Phil, Canny and Griffin all started their sprints and Matt started to wind up. 150 metres to go and Tony still has the smallest gap over Phil and Griffin, but here comes Matt. He sweeps through with only Tony ahead, catches him inside the final 50 metres and takes the win with a clear margin. Welcome to Scratch! A gallant platoon of 7 prepared to battle the first race of the W.A.R.S. 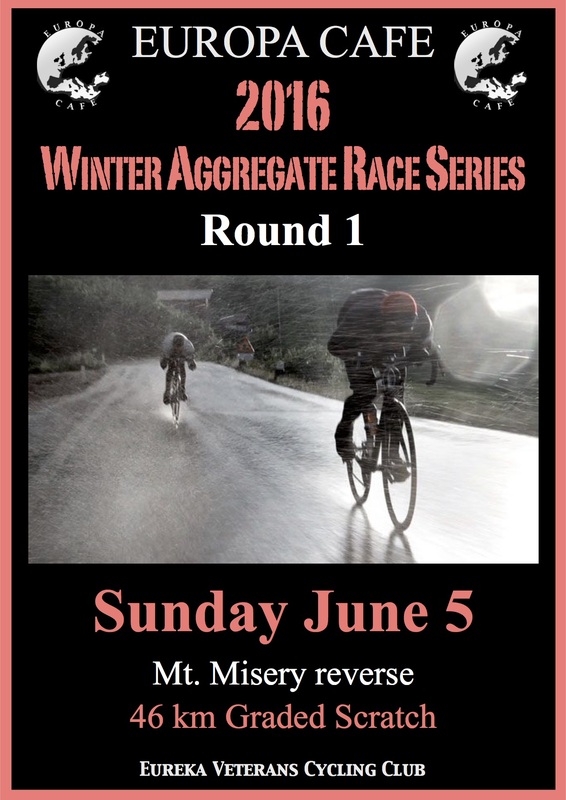 in B Grade – their mission…to race the aptly named Mt Misery circuit and survive. The field greeted a new recruit, Mark O’Callaghan, a rangey fellow who although somewhat apprehensive looked comfortable and acquitted himself with honour and bravery, and is therefore mentioned in dispatches. Brian and Kevin Lee also found themselves with the daunting prospect of a challenging parcour and impetuous company, the heat of battle tested Kevin’s resolve and once the race reached the cima coppi, you could stick a fork in him – he was done. Meanwhile Brian soldiered on, undeterred and huffing and puffing his way up the climb, he could not be shelled. Duncan Psycho Bates was in rare form, obviously been training and dropped some weight he animated the race with several sorties and digs down the Ercildoune Rd when everyone else was looking for cover. His race plan was obviously a war of attrition, trying to wear down the sprinters and climbers. You couldn’t miss Michael “Mr. Giro” Veal, either his fluorescent pink overshoes pulled your eyeballs out of your head or his antics on the shoulder of the road questioned his sanity. Mr Giro road a strong race, riding tempo up the climb to deter a salvo from the smaller riders and stretching their puny legs on the flat. Bob “Spongebob” Morley is an enigma, every week he is in the contest, riding smart and riding hard, how he can be that competitive with the modicum of training is one of life’s mysteries. Bob hardly ever comes to the front in a scratch race, too smart for that, but today he decided at times that he would be the hammer and insisted that the rest chase him for a change. After testing eachother along Ercildoune Rd, and up Black Bottom Rd, the compact field turned left and began the climb up Mt Misery. The lonely giant windmills were the cue for Peter “Fifi” Livitsanis who had been waiting his turn, as soon as the road went up he went to the front, via the gravel on the side of the road. Fifi and Mr Giro exchanged turns on the front gradually winding up the tempo, trying to split the field. Popeye was gone but somehow the rest made the top. 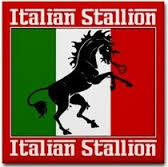 The next test would be after the descent and the left turn at Addington, a series of small rollers with a couple of pinch points that Fifi, Mr Giro and Pyscho tried to exploit, the field was strung out but the elastic was still in tack as they turned for home. The corner was a lot tighter than anticipated which slowed progress and with everyone settling for a final sprint the field came back together. Not an easy sprint to judge, you can see the line a long way out and one final little rise usually knocks the stuffing out of those that go too early. Mr Giro slowed things to a crawl, inviting an early attack. Pyscho obliged and took off at the cemetery corner, Fifi grabbed his wheel, knowing full well that this attack would end in tears. Spongebob had laid his money on Mr Giro and was waiting patiently on his wheel. As the steam started to come out of Pyscho, Mark O’Callaghan countered, Fifi saw this one as far more dangerous and swapped wheels and the two separated from the rest. Bob saw he had made the wrong bet and jumped off the cramping Mr Giro and took off in pursuit. Fifi got to his spot on the road and launched his sprint, despite Spongebob closing Fifi held to the line to take the win, Spongebob in second and a great second effort saw Mark hold on for third. Another new rider to Eureka and another standout performance from Steve Linnane who stood up to win his first ever bike race. Steve was in great company for his first race, the Amazing Mandy Rudwick, and the seasoned veterans John Faulkner and Neil Braszell, all provided excellent race coaching. So good in fact was their instruction that not only did Steve hang on, but he sprinted clear to win the race, grinning from ear to ear. Mandy continues to impress and worked hard all race ensuring the race was a test of endurance, the climb favouring her above all others, she powered along and in the process shelling a couple. Rather than the big attack and a solo ride to the finish as it is quite often the case, it was a different race plan around a slightly unfamiliar course – keep the watts up but don’t go into the red. Neil Braszell’s return to racing continues, each race his improvement is obvious and he’s come a long way since the early season crits on production drive. Similarly, John Faulkner is gently easing his way back into racing, a difficult guy to chase down when he is on song, the backmarkers all fear a return to form from this gutsy competitor. 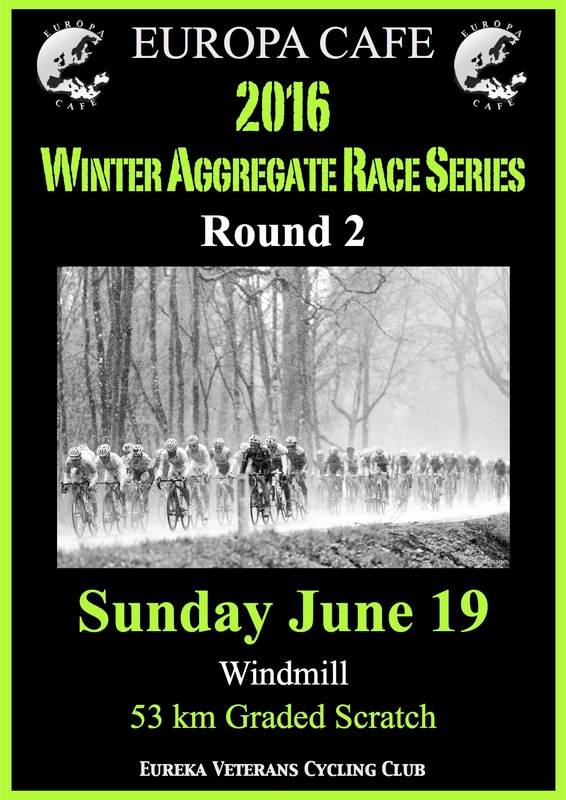 The Eureka Vets CC are excited to announce that Europa Café are continuing as sponsor of the Winter Aggregate Race Series. Jason is on his comeback trail after a nasty fall during the 2016 Cec Cripps open race at Maryborough on Easter Monday. Just like the exciting new meals on the menu at Europa Café, the W.A.R.S. are also bigger and better in 2016. 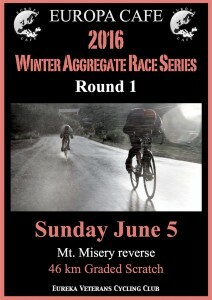 Seven rounds of racing will decide the ultimate winter cyclist. In between racing, visit Europa Café which is located right in the centre of Ballarat at 411 Sturt Street. Just a block and 1/2 “up” from the Town Hall, Europa Café is perfectly situated close to the Central Square shopping precinct. Europa Café is a spacious, inexpensive family style café, where the coffee is great and the buzz is lively. The lunch/dinner menu is seasonal and ranges from Italian to venturesome and imaginative Middle Eastern and Asian dishes. The wine list is extensive and admirable with many by the glass. All day breakfast at Europa Café has become something of an institution. Open everyday from 7:00am for breakfast and lunch. 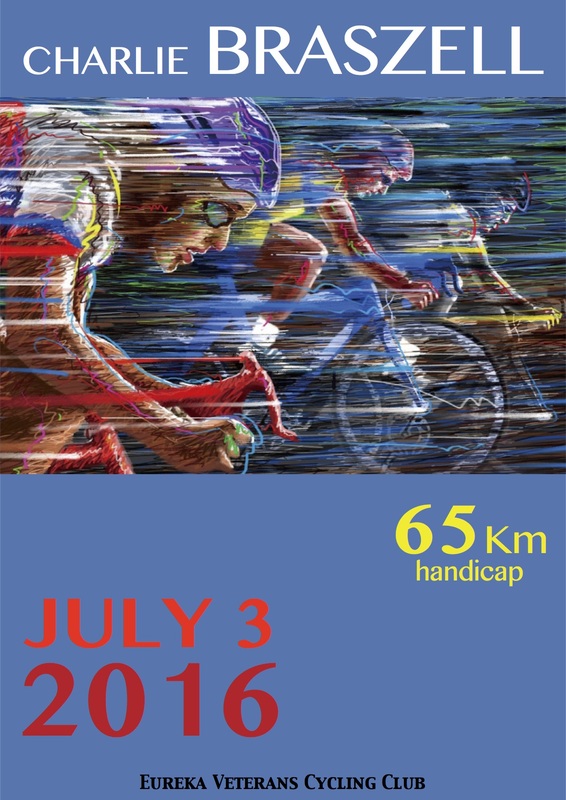 A constant 50 kmh northerly that gusted above 70kmh during the race was a challenge for the modest field assembled. This was not a day for the front markers with most abandoning, however both Scott Denno and James Gretton persevered long after their races were lost. Both men riding out the race solo, a brutal effort of self-flagellation that quietly impressed. In a war of attrition it was the two larger groups that won the day. The back of the race boasted five riders in Second Scratch and five riders in Scratch, with 4 minutes separating them. Bob Morley ensured a day of pain for himself. He self-selected for a Second Scratch that included very strong riders in Grant Dawson, Rick Calvert and Rob Phillips. Sharing Bob’s pain was Andrew Rushton, who is still working his way back to race fitness. Andy also found himself in this illustrious company for a day of leg breaking. First lap over the Donavan’s Road pinch, the Rob “Big Mig” Phillips lifted it and Bob and Rick “Rinso” Calvert were off the back. Rinso thought it would be not be prudent to drop the handicapper so called the Mig back, and they both got back on. Phillips and Rinso then did some huge turns down wind. Bob was on a compact and just stayed on the back and only just. He found it more comfortable with the side and head wind and did not miss a turn. The 4 minute crew successfully held their ground, losing only a minute or so on the first lap. It was going to be a close run thing if they were to hold off Scratch, however the local dairy farmer had something to say about that. Mid race he decided to go a-droving, sending 100 head of Friesians down Donovan’s Rd. Held up and effectively helping the farmer to move his cows along, the 4 minute crew quickly lost whatever advantage they had (over Scratch) going into the final lap. The Scratch boys were rolling well in very trying conditions. With the weather the way it was the strongest riders and largest groups were favoured, and if they worked together then it was a day for Scratch. Dean Griffin played the Road Captain role and kept them well organised. Working with the precision of a reasonably priced Japanese watch they took short 15 – 20 second track turns except when Mr Griffin and the other Dean (Dean Wells) sacrificed a few matches on a few longer turns when power was required…usually uphill or into the wind. Brendan Schiemer went looking for Strava glory and put the afterburners on the first time down Donovans Rd and had the rest all struggling to keep in touch. Phil Cartledge never missed a beat (even after embarking on an epic mountain climbing ride the day before) and Tony (backing up from a solid win at Ballarat-Sebastopol CC the previous day) enforced strong climbing up the Quarry Hill. In the final analysis Scratch could see that their chase was going to be successful, so confident were they (particularly post cow incident) that that they left Second Scratch dangling 20 seconds in front for about 6 kilometres before making the catch. During that time the last lone rider (James Gretton) was caught just before the Quarry Hill climb. Deano Griffin put the race into the gutter after Cricks Hill on the run to the church and Bob Morley popped just before the turn – a huge ride in that company!? ?Rick Calvert took off just after turning down Creswick-Addington Rd and opened a small gap. Brendan and Tony followed but took quite a while to reel him in. The rest were struggling in the crosswind. Rob Phillips and Andy Rushton were working with Dean Griffin; Grant Dawson was in no man’s land just behind them and Phil was locked on Dean Wells wheel. Tony, Sheems and Rick had a good margin turning into Donovans Road…enough that it was unlikely they would be caught unless someone “blew up”. Deano dropped off from Andy and Rob; Phil launched around Wells to try and cross to that group, and Grant had dropped off the back. Tony and Sheems worked Rick over up the short rise and cleared out in front. Rick battled away and was still at least 100 metres in front of Rob and Andy. Phil passed Deano too quickly for him to latch on, then caught and dropped Rob and Andy – but downwind and downhill is a bad combination for closing gaps and the Club Champ would remain in fourth position to the line. Closing to the last rise and Tony had scooted clear of Sheems and the rest of the field were strung out over a kilometre. Rick, Phil, Rob, Andrew, Dean, Deano, Grant…etc., etc….all time trialling with the gale force tail wind and not really closing any gaps, but each having to move out of the way of club affiliated vehicles that wanted to also race to the finish line. Tony crossing first not even bothering to get out of the chair. Brendan screaming home for a great second and the aggressive Rick Calvert hung on for third despite nearly being killed by the Directeur Sportif in the blue ute and the Tail Car both deciding to pass him just fifty metres from the line. The Second Scratch bunch (4 minutes) just before heading out into the wind. Were they ultimately robbed of a handicap win by a bovine blockade?